Coverage just got a makeover. 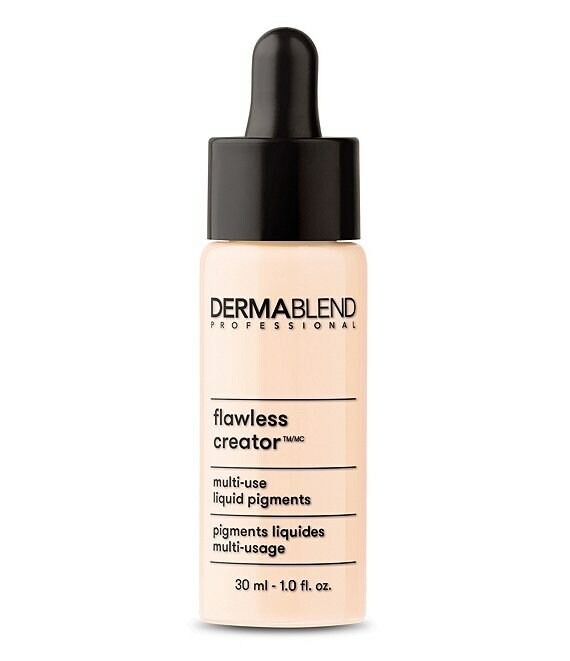 Meet Dermablend's best lightweight foundation: Flawless Creator, with 33% concentrated pigments for weightless, customizable coverage anyone can wear, in any way. This water-free, oil-free foundation has a unique, silky texture that's customizable, buildable and blendable. With fewer than 9 ingredients, you get pigments at their purest: a little goes a long way. To each their own: you define your flawless creationuse alone or mix with skincare. For minimal coverage, use 1 drop; for maximum coverage, use up to 4 drops. Developed in true-to-tone fade-proof shades. Never cakey or masky for an even and natural look. Provides 16 hours for comfortable wear that is smudge- and transfer-resistant*. Formulated without parabens, phthalates, triclosan or sodium lauryl sulfate. Vegan formula: no animal-derived ingredients or byproducts. Dermatologist-tested for safety. Fragrance-free, allergy-tested, sensitive skin-tested. Non-comedogenic and non-acnegenic. Multi-Use: Wear alone or mix with your favorite product. Apply: Shake well. Blend with fingertips or buff with brush. Build: For more coverage, add more drops (up to 4). Set: For 16 hours of wear, apply a generous amount of Dermablend Setting Powder (sold separately) and leave on for 2 minutes, then buff off.